Located just east of the Guild Lobby (map). For details about Hot Zones past and present, check out this wiki article. This page last modified 2013-06-19 09:42:57. Not sure if anyone posted this earlier. You can accumulate more than one task. How? (and it's not a glitch) You just take the recommended task that of each zone for your level, and DO NOT complete them. If you do complete one, you're locked out from taking more tasks. However, once you've gotten all the tasks you want to bank. Then start doing them all. You will net a huge amount of exp in a short bit of time. So in case you didn't realize it or it wasn't mentioned above. You can accumulate multiple tasks. The 95 task says to kill gust of wind in Resplendent temple. Something seems to blow me around in there but i ran every room on map and didn't find them or get one on target . I am pretty sure there is no such mob in the zoom (originally) so if they added them then they don't seem to be working correctly. As of the patch on 4-19-16 the level 75 task sais to kill 5 Stormscape Skypriests in Jewl of Atiiki. Since Stormscape Skypriests don't spawn in Jewel of Atiiki it is impossible to complete the task. Now because its bugged i thought i would try to kill the Stormscape Skypriests in the Buried Sea. It did not count towards the quest. EDIT: The hot zones were suppose to be on a 3 month rotation but i guess they decided to change it with the next patch which was on 5-18-16. Yeah, I'm pretty sure. If not a full DOUBLE, certainly a BIG positive factor. Luckily I decided to keep track of AAs earned doing the level 90 hot zone tasks during the month of August for my boxed group. So I have a solid statistical history to work with. The numbers vary somewhat because I only log in the total AAs right after the mission is completed. So I don't account for rounding and I do include the AAXP earned DURING the process of killing the 5 target mobs, which might include anywhere from 0-10 random trash mobs who had to be killed clearing to the target mobs (usually only a couple or fewer since I try to be efficient and just pull the mob types I NEED. But these variables don't detract from the obvious fact that my AAXP award for completing the hot zone tasks went up a lot, presumably double or close to it. Reviewing the data for my lesser-AA toons, it does appear the bonus was less noticeable on them. For example, my 100 enchanter with 3600 AAs went from avg 13 to avg 18. So could it be the double-AAXP only applies to the "base" AAs awarded to max-AA toons? Whatever, it's clear to me that DOUBLE-XP WEEKEND had a BIG impact on AA's awarded for hot zone tasks. I can't speak for partisan or other tasks with AA awards since I did none of those during the weekend. BTW, I never used Lesson of the Devoted or any XP potions during this process. Obviously, the exp you gain from killing mobs is double. I'm talking about the actual exp you get when you complete the task itself. This is not variable. It should be exactly the same every single time. So. I get a task that says "kill 5 <random mob> in Hill of Shade". I kill 5 of them. When I kill the 5th one, I get the usual exp message, but will also get a "You gained X AA" that is tied just to completing the task (not sure if you get that on the 5th kill, or when you click "accept reward"). That's the reward exp. And it's not double. Like I said, I get 11 AA from just that reward. Heck. It's possible that I happened to be close to a full bar when I finished those two times and that's why I gained 12 instead. Which would mean that exp multipliers don't affect it at all. Look at the actual message from the task completion itself. Counting total AAs gained during a period of time while completing it isn't the same thing. I think you'll find that the exp from the actual task doesn't increase. Okay I did. I am right, or half-right. Maybe 3/4-right. LOL. Double-XP weekend doubled the "base" number of AA's awarded by hot zone tasks, at least for level 90. The minimum AA's you earn from completing a level 90 hot zone task BY A LEVEL 100 TOON is SIX. That's for toons with 4000+ AA's. I checked the logs. The day before Double-XP weekend, my druid with 6000 AA's earned 6 AA's per completion. Over Double-XP weekend he earned 13. I think there is some kind of rounding based on how far "into" the next AA you are which might explain why it wasn't 12. This is derived from the explicit line that tells you how many AA's you earned from completion of the "A Simple Task." My 100 enchanter with 3800 AA's went from 11 per task to 17. Note the difference is 6, the base AA value of the task. My 95 Ranger with just under 3000AA's at the time went from 24 to 30. So it's DOUBLE if you're at the AA level where you get no bonus XP for having low AA.s. Which means the code for Double-XP weekend does NOT double bonus AAXP. This is the same as how it handles XP potions or LotD, If you use a 100% XP potion during Double-XP weekend you don't get quadruple-XP but "only" triple-XP: it's additive not multiplicative. The AAXP I gained from the killing of the 5 task mobs, as opposed to the AAXP awarded for completing the task, can't be enough to affect my totals as shown here, not even with doubling. So I think I was getting significantly bigger task awards of AAXP as well during double-XP weekend. I will see if I can check my logs and see what the actual awards were. I had forgotten about the message that mentions how many AAs awarded at the completion. I do remember a message that tells you your new current unspent balance, but that would be affected by how many AAs you had unspent prior to receiving the award. These tasks award DOUBLE the usual # of AA's during DOUBLE XP weekends, like Labor Day 2013. Worth noting for future reference! Are you sure about that? I don't think this is correct. I've been doing the tasks in HoS off and on for a couple weeks. At 100% AA exp, I get 11 AAs each time (that's at just under 2500 AA points spent). About a week ago, I finished a set while LoD was running and got 12 AAs instead. Clearly, a small portion of the exp counts as regular exp and can be multiplied by stuff like LoD, but the bulk is flagged as task exp and isn't. I also completed one of the same tasks during the double XP weekend, but was set on 50% AA exp. Guess what? I got 6AAs (and maybe 2-4% exp, wasn't really paying attention though). So my tests at least suggest that things that multiply exp gain (like potions of adventure, lessons of devoted, and double XP weekends), only increase the gains from these a small degree. Definitely not double. If you actually tested this and have numbers to share, I'd be interested in seeing them (and trying to find out why I didn't see the same thing). It's entirely possible that some tasks work differently than others, and it'd definitely be good to see which ones (if any) do behave the way you said. Before the recent patch he would give 2048pp for the lvl 85 and alternate task. That would be 4096pp per character as well as 2 junk items you could sell for about 10pp each. Since Everquest went free to play you could make as many accounts as you want without having to pay for them. So some one six boxing could have easily made about 25k a day. Now the lvl 85 task gives 175 pp reward and the same junk item. Major nerf for anyone that boxed a lot of characters and used his line of tasks to make money. I honestly don't see the point of even getting tasks from him anymore. Maybe if the lvl 90 version reward was any good but even then its only 200pp and the same junk item you could get at lvl 85 if im not mistaken. I suppose if you are going to go to a specific zone to mindlessly grind away and he offers a reward for killing 5 mobs in that zone then you might as well grab the task. The exp reward was boosted. My 100 zerker with 3kAAs did the Grounds task and got about 12AAs. Bryko is right. The exp reward has skyrocketed. I did the lvl 85 task and got 6 aa points on my monk with 100% exp going towards aa points. My monk has over 4500 aa points. EDIT: Im not sure if it had anything to do with it being 4th of july with the exp bonus but my monk gained 14 aa points for doing the lvl 90 franklin teek task. If im not mistaken exp bonus does not count towards quest exp though. EDIT: Maybe i was wrong about the exp bonus not applying to task rewards. Though technically no matter what happens you are instantly given exp upon completing the last kill in the task so i think it is operating differently then most older tasks. It must have been coming in at a bonus because now im only getting about 6 aa points on that monk for completing the lvl 90 and alternate tasks. today 3 of us tried to get the kaesora library task but he never gavre it-- only showed tosk. We got the Kaesora task from him on Dec 12th. You had to say Alternate to get Kaesora as the zone was not listed by name. Just needed to read thru the whole text he gave. NM I am just blind is all - sorry. They added 2 level 80 hot zones. Toskirakk and kaesora library. 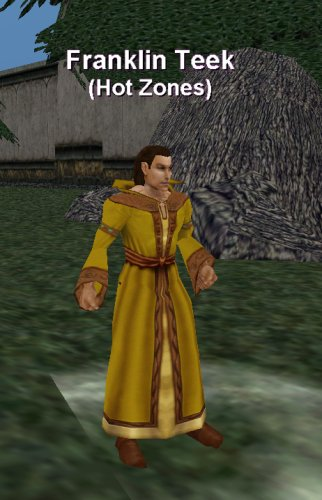 You can view the other hot zones via http://everquest.allakhazam.com/wiki/EQ:Hotzones . He seems bugged at the moment though. There does not seem to be a way to get him to give you the level 80 alternate hot zone no matter what line of text you use. No one in game in general chat or general1 seem to know how to get the alternate task on the cazic-thule server. Never seen any posts here mentioning exactly how to get it either. Hopefully some time after my post they will have this fixed. Some how today i was able to request both lvl 80 tasks from Franklin Teek. Perhaps i had to have done 3 or more tasks from him to get it in the first place but if that were the case some one would have surely said something on the cazic-thule server about it. They are quick to respond when its to correct some one on a subject. EDIT: Tried the next day and only got offered the one zone toskirakk. I don't really know why. Im done speculating. Maybe its just random and im the only dumbass that didn't understand it. Dont think this is possible... Would love to be wrong tho. There is a level 75 Version of this quest now as well. If you have logs and/or screenshots, please send them to eqteam@allakhazam.com. A task window opens offering a choice of "A Simple Task - Level 20", "A Simple Task - Level 25", etc., up to level 75. (There appear to be level requirements. My level 34 wasn't shown the tasks above 35.) You can also just say "task" to Teek and skip straight to this list of tasks. 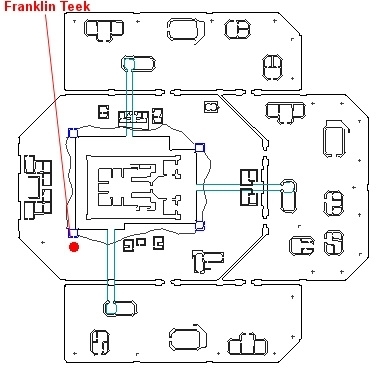 Every task description looks the same: "Complete the task that Franklin gave you." Once you accept the task, you can see what today's target is. For instance, today when I accepted the level 75 task the instructions are to "Kill 5 Gargoyle" in Dreadspire Keep. A few days ago it was killing 5 Shadowmane, and once it was kill 5 bats. You cannot take more than one of the tasks at a time, and you can't take another task from Teek until 18 hours after you accepted the previous task. Hot Zone Tasks: In addition to reminding players about the current Hot Zones, Franklin Teek in Plane of Knowledge now offers tasks for the most recent Hot Zones. Each day, the task objective for each task changes, but is the same on that day for all who request it. Each task objective consists of kill 5 something. If the something is general, like sabertooths, then any sabertooth in the listed zone will work. If it is specific like vicious bears, then only a vicious bear will work. Reward does not change for any given task, it is always some experience and a certain amount of platinum, which corresponds to the level of the task, being 1, 2, 4, 8, 16, 32, 64, 128, 256, 256, and 512, respectively as you go up in task level. Once you complete a task, there is an 18 hour lock out on requesting any task starting from the time the completed task was requested.